As the days get colder in Frostpunk, you’re going to need to increase the Steam level of the generator. By default, you start with Steam Level 1. If it becomes too cold, you’re able to go into ‘Overdrive’. Essentially increasing the amount of heat emitted in exchange for a lot of Coal. However, by unlocking new Steam Levels, you can increase the amount of heat and keep people warm without burning through all of your coal. I like to sit on Level 1 in -20 degrees and 30 degrees, then push it up to Level 2 during -40 degrees. To actually increase the level, you need to research into ‘Generator Power Upgrade’. If you haven’t already, you will need to build a Workshop in Frostpunk. This allows you to research into new technologies, including Heating, Exploration, Industry, Resources, Food, Health & Shelter. To start, make sure you have unlocked Tier 1, ‘Drawing Boards’. It will allow you to research the first tier of technology. 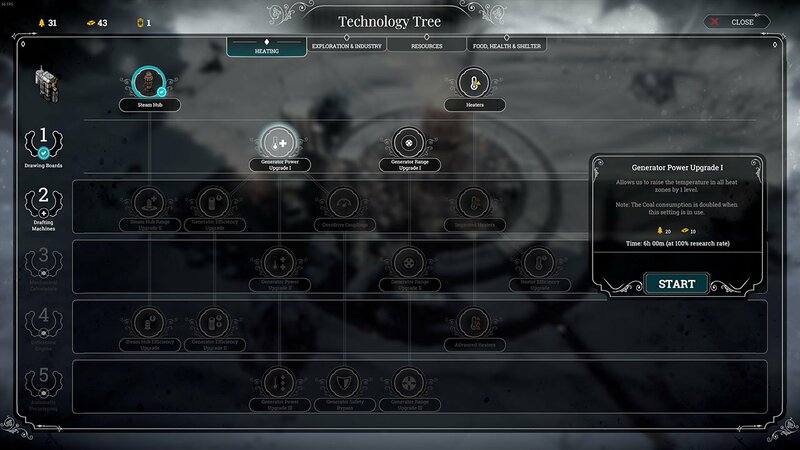 You can do so by pressing the Number 1 on the left side of technologies tree and researching. Under the Heating Tab, you can then research into Generator Power Upgrade 1 for 20 wood and 10 steel. Meanwhile, you can also choose to research ‘Generator Range Upgrade 1’. However I don’t really need this due to currently using Steam Hubs. Once it’s been researched, you can then activate the second level inside the Generator.